Apex Wheel Cleaner cleans brake dust and road grime from chrome, painted, polished and powder-coated wheels. 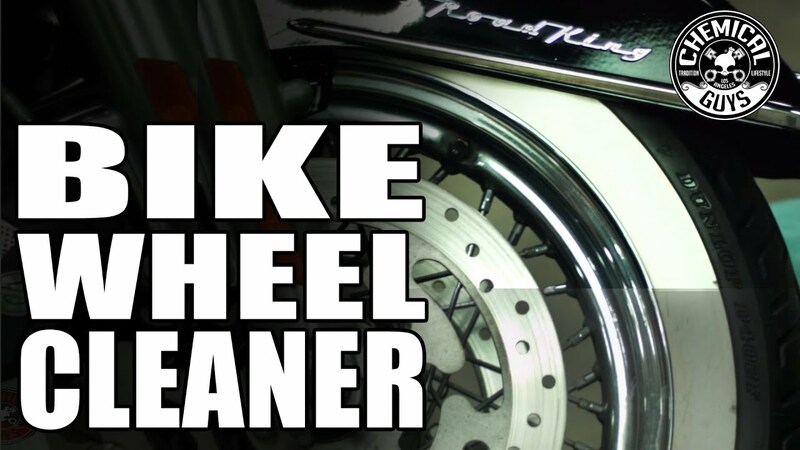 Apex Wheel Cleaner easily cuts through heavy caked-on brake dust with an intense yet gentle cleaner for motorcycle wheels, brake parts, and suspension components. The pH-balanced formula contains no strong acids nor bases, and is safe for all types of wheel finishes. Apex Wheel Cleaner safely cleans painted, chrome, polished, cast, forged, anodized, carbon fiber, and even laced motorcycle wheels. Tires are often overlooked during a detail, but cleaning and prepping them gives a squeaky clean and freshly reconditioned look. It is safe to use on all types of motorcycle tires, including sport street tires, race slicks, touring tires, studded ice tires, and nubby off-road tires. Whether the sidewalls get caked with burnt up rubber, intense road grime, or mud and pebbles from adventuring off-road, scrub it all out with Apex Wheel Cleaner to get your motorcycle tires looking brand new! Spray wheel cleaner on wheels, tires, brakes, and suspension components. Let sit to break down filth and grime for several minutes. Use brush to gently agitate dirt and grime. Rinse away filth, cleaner residue, and soap with sharp stream of water and dry with a clean microfiber towel.